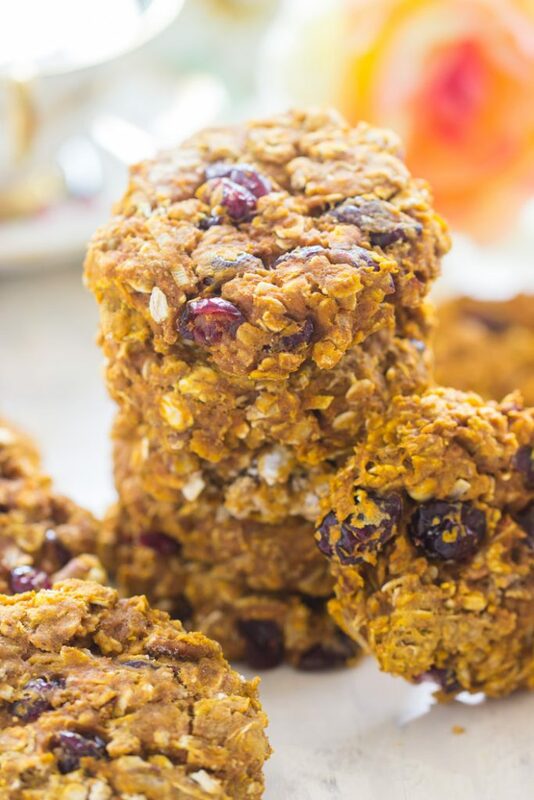 Soft, chewy, pumpkin-oatmeal breakfast cookies, loaded with pecans and dried cranberries! 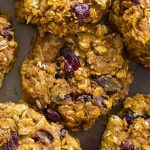 These Cranberry Pumpkin Breakfast Cookies are nutritious, high in protein, hearty, and filling. 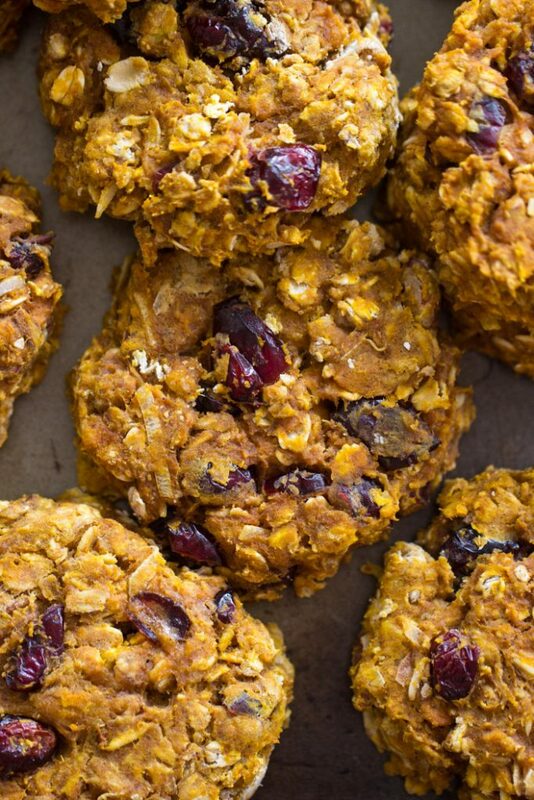 So many wonderful ingredients packed into these Cranberry Pumpkin Breakfast Cookies! Whew – today was a long day. I must say, I can’t wait for September to be over. I love the start of fall, but September’s been a wacky month. Between the hurricane (I’m done talking about it now, I swear! ), and then finding homes for the kittens (they went to a rescue group to be adopted out! ), and tonight I drove to Tallahassee for work, which is about 4.5 hours away. I have a few meetings in the morning, and then I come right back home, so it’s a lot of mileage in a short period of time. I’ve been really keyed up this whole month with so much unusual activity! I’ve found it really hard to wind down when I need to. Even tonight, after driving all evening, I’m a bit wired from needing to concentrate and to stay awake. I can finally sit down to relax for the rest of the night, but I’m struggling to do so! 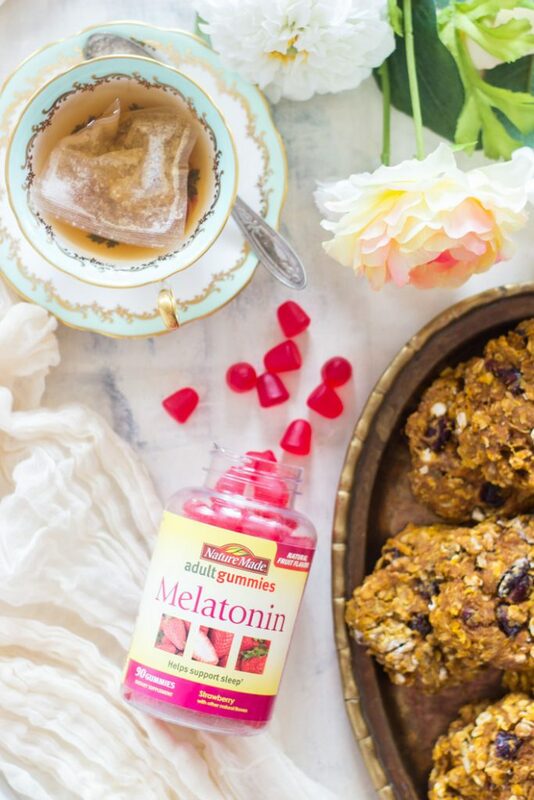 I packed Nature Made® Melatonin Adult Gummies in my overnight bag, so those should help me out. I was never sure that melatonin would be effective for me, but my S.O. always swore that it helps support a good nights’ sleep and helps to reset his sleep/wake cycle.† I’ve used them occasionally for the last few years, and I really like how they support sleep for me.† Each gummy provides 2.5mg of melatonin, and I stash these with me when I travel and when I’m sleeping in an unfamiliar place. But I also like these for when life is hectic and I’m finding it hard to stop my mind from racing before bed. The sweet strawberry flavor of these gummies is also a bonus! I love Nature Made® Adult Gummies because I really dislike swallowing pills. I think most of us are not fond of that. It actually prevents me from taking any sort of multi-vitamin or supplement if I have to swallow it in pill form. 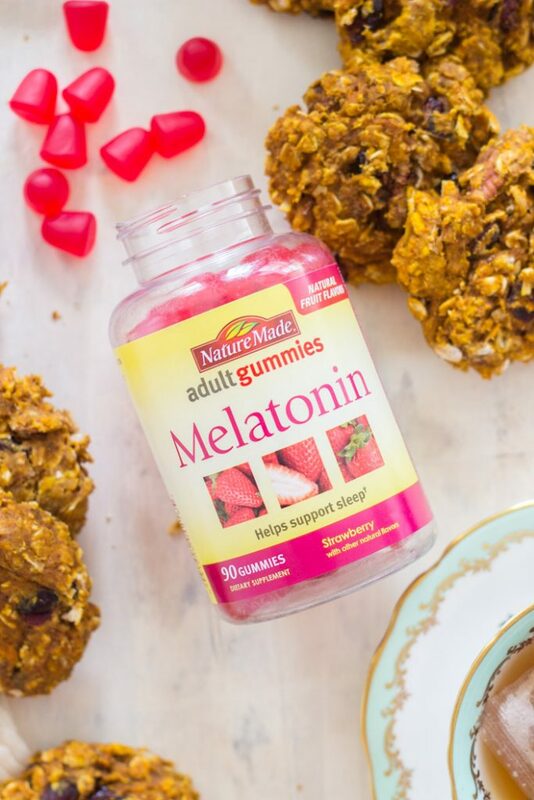 The Nature Made® Adult Gummies get me the nutrients I need and in a much simpler and tastier format! I love them, and I take a few different ones. They’re “a gummy you can trust,” and you can be assured that you’re getting essential vitamins and nutrients from them. In fact, Nature Made® tests their gummies for purity and potency so you can feel confident that you’re getting what you need. 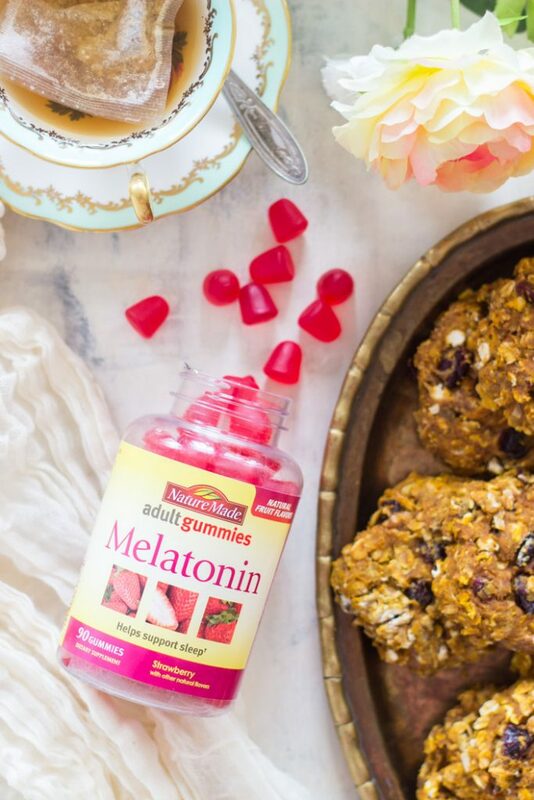 They’re easy to find at Walmart, and that’s where I grabbed the bottle of Nature Made® Melatonin Adult Gummies. 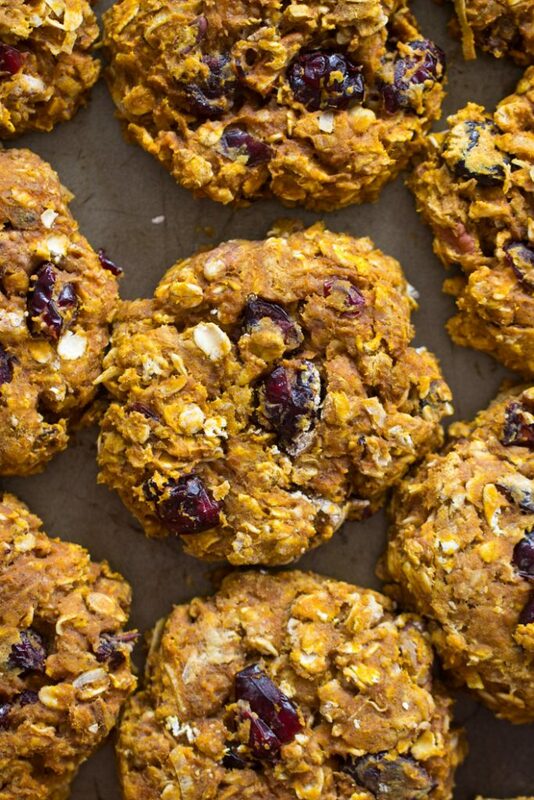 Before I left this morning, I threw together a batch of these Cranberry Pumpkin Breakfast Cookies. I whipped up the dough in 10 minutes, and they don’t take much longer than that to bake. 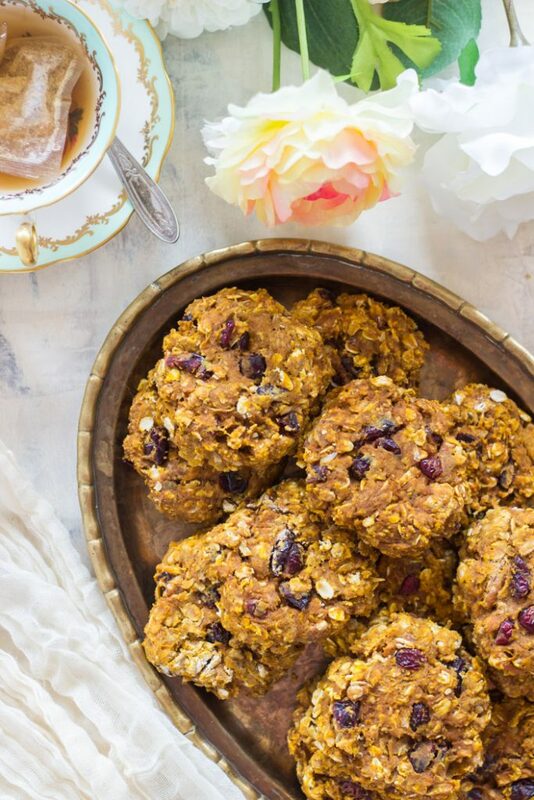 These soft, chewy, pumpkin-oatmeal cookies are loaded with nutritious ingredients, high in protein, and are hearty and filling. They’re stuffed with dried cranberries, pecans, and a touch of coconut! So many delicious things packed into these cookies. These are fantastic to take on-the-go for a quick breakfast or snack. 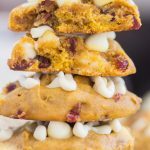 I love these Cranberry Pumpkin Breakfast Cookies, and I’ve used this basic breakfast cookie recipe to create a bunch of other versions too. If you like to have quick, healthy breakfast options that you can pack to take on-the-go (who doesn’t? 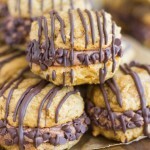 ), you might also check out these Chunky Monkey Cookies, and these Chocolate Peanut Butter Banana Breakfast Cookies. And a few of my most popular protein-packed recipes are this Blueberry Cinnamon Swirl Protein Coffee Cake, these Pumpkin Protein Bars, and this fabulous Almond Coconut Mocha Protein Smoothie! In a medium bowl, whisk together pumpkin puree, egg, peanut butter, and vanilla. Fold in the pecans, cranberries, and coconut. Drop by tangerine-sized scoops onto parchment paper-lined baking sheets, and flatten with the bottom of a glass that's been lightly greased. Bake at 350 degrees for 12-14 minutes, or until cookies are lightly browned. These are great warm from the oven, but also at room temperature, and even refrigerated! It makes 12-14 3-inch cookies! I hope that helps! Hi Donna: I don’t provide nutritional information, so I’m not sure, but I do know that there are a lot of calorie calculators online! You could plug the ingredients into one of those. Thanks! Have you ever tried it with a different nut butter? What were you thinking of trying these with? Most any nut butter should work totally fine! I’ve used this recipe quite a bit, and it’s pretty versatile. I’ve used almond butter, and it works great too. Are there any possible substitutes for the peanut butter? 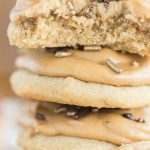 I’m not a big nut butter fan but think these cookies look amazing! Hi Andie! The peanut butter isn’t very strongly flavored in the cookies, and is used more as a binding agent. What about almond butter? It’s so mild! Or cashew butter? Those would work. I would think that about 1/4 c. coconut oil would probably work well as a substitute too, but I haven’t tried that myself! I made these for a road trip and love them! Not so sweet like most recipes. Very tasty and the recipe would be very versatile. Thank you for sharing!! What is oat flour. I’ve never seen it before. Can I use just regular or whole wheat flour? Yes, absolutely! Oat flour is extremely finely ground and milled oats. I just like it because I feel like it’s a bit healthier, and it substitutes easily for most other flours. All-purpose or whole wheat will work fine too! Hi Marilyn!! I’ve made quite a few variations on these, and they usually stick together pretty well… I wonder if it has to do with flour substitutions? I don’t use almond flour that often, and I’ve never used hemp, but I suppose that could play a part? 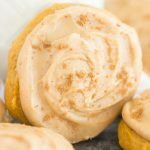 You could try adding a little more pumpkin to them, or an egg white or something! That might help with cohesiveness! I’m SO GLAD you like them though!!! That made my day to hear that!! 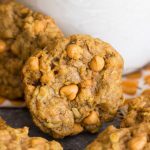 There’s a few other versions of breakfast cookies on the blog, so check them out to have some alternative options for your on-the-go breakfast. I’m the same way – I generally try to avoid packaged protein bars. 🙂 Thank you again, and I hope you have a wonderful weekend!